THE WELL USED label of ‘crossroads fight’ is one that is familiar to Martin Murray, more than most. The particular piece of boxing terminology was again being bandied about in his direction when his potential barnstormer against Hassan N’Dam was announced for the Manchester Arena on December 22 in support of his stablemate, Carl Frampton, challenging for the IBF world featherweight title held by Josh Warrington. Middleweight Murray now uses the mere mention of retirement as motivation to keep on winning. He is not having one last one for the road because the 36-year-old still firmly believes he has got a world title win in him. However, if he were to lose another fight, he will call it quits and that has been the case since he suffered a points reverse to George Groves in June 2016. “I know how important it is to win anyway, but I think people want to see me retire!” quipped the four-time world title challenger. “The stakes are high and I think people do want to see me retire more than I do because it gets thrown in my face all the time. 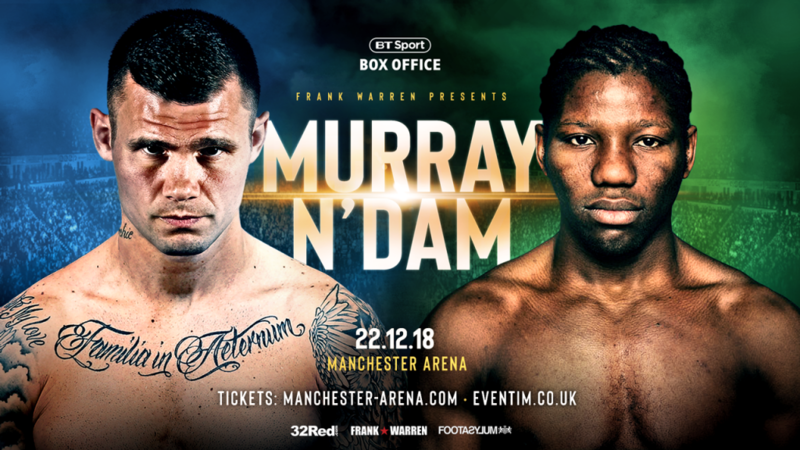 Despite being one loss away from collecting his punching pension, the force of Murray is showing no signs of diminishing and he demonstrated that he remains in the belt collecting business with the hard-fought victory over Roberto Garcia for the WBC Silver title last time out in June. “I’m feeling great, you know, really good. I am one loss away from retirement, although I don’t want to retire, I know it is one loss away. So I am focusing, training hard and really enjoying the work at the minute. “I keep getting the crossroads fight thing thrown at me by people. A really good mate of mine, a couple of months ago, said to me that after the Groves loss he never thought I would still be here. “Everybody wrote me off after Groves, but I have just survived, scrapped and scraped – and I am still here. IBF world featherweight champion Josh Warrington takes on former two-weight world champion Carl Frampton at the Manchester Arena on December 22nd live on BT Sport Box Office. Mark Heffron and Liam Williams contest the vacant British middleweight title and Belfast’s blue chip featherweight prospect Michael Conlan (9-0) takes on former commonwealth champion Jason Cunningham (24-5). In a step up, Nathan Gorman puts his undefeated record and WBC International Silver Heavyweight Title on the line against former World Title challenger Alex Leapai. Tyson Fury’s younger brother Tommy Fury also makes his professional debut.